Linda "LZ" Zaworski - JustKeepingBusy: Fun, Fun, Fun! More fun stamping with my friend Lynn Ha. I honestly didn't get hardly anything done because I was so tired. But... Rich wanted me to make him two thank you cards, with a squirrel on it. This is one that I started working on, just the image so far. He is from http://www.whippersnapperdesigns.com/ Whipper Snapper Designs. They have some fabulous cutsie stamps!! 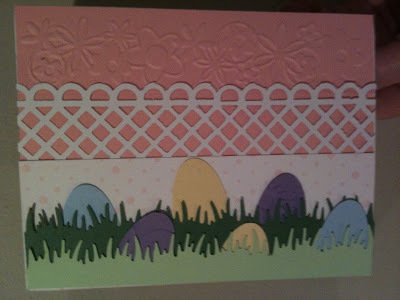 I colored this with my Stampin' Up markers and blender pen on watercolor paper. A friend told me how to use the markers like Copics... so Copics, smopics!! I can afford watercolor paper more than I can the copic markers anyway. 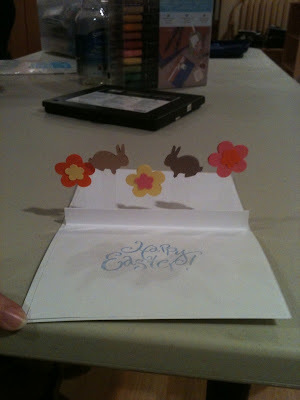 Then Lynn shows me Tess... (from Stampin' Up). I call her Cheetah Tess. This is sooo gorgeous in person. 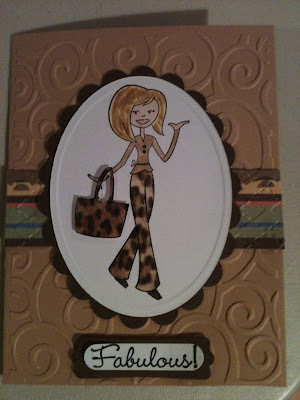 I LOVE how she stamped the pants and purse onto patterned paper.. sooo cool! The center, she has the punched out items on transparency, so you can see them "float". I love spending time with my friends!!!! Water coloring on the Naturals Card Stock works good also. The paper absorbs the water good. Love the cards.